"We had an excellent 2 days on the Scottish Hills with Dave. One day in Glencoe, the other near Fort William. As someone who takes to the hills in all seasons, I should've done this course a long time ago. I'll feel more confident heading out in winter now and using this base knowledge it's something I can build on further. Dave was great at explaining what should be done and why it's done that way, and he also brought two cracking clear calm days with him which was nice. Looking forward to Gran Paridiso with hopefully the same weather as we got. Last Weekend Dave & Bill came back for another long weekend of winter mountaineering based in the West. After one fine and long day completing the Carn Mor Dearg circuit on Ben Nevis the West Coast ming factor arrived and 2 tough but good rewarding & productive days were 'enjoyed' climbing Scottish grade 1 snow & mixed ground on the East Face of Aonach Mor and then the fine North Ridge of Stob Ban in the Mamores. Many thanks for proving to be such an excellent guide during our 3 day walking and climbing trip in Scotland. We had a fantastic few days and you seriously put us through our paces with some challenging routes and expert, patient tuition. We thoroughly enjoyed our adventure. We hope to meet up again in the mountains one day soon, many thanks again and all the best for your future in the mountains ! A fantastic few days and you excelled again with another great choice of guide. Jonathan seriously put us through our paces in challenging conditions on Aonoch Mor and Stob Ban and was a patient and vastly experienced mountain man. We have various other projects in the Highlans over the next few weeks and our next open alpine training weekend is the 23-24 April. 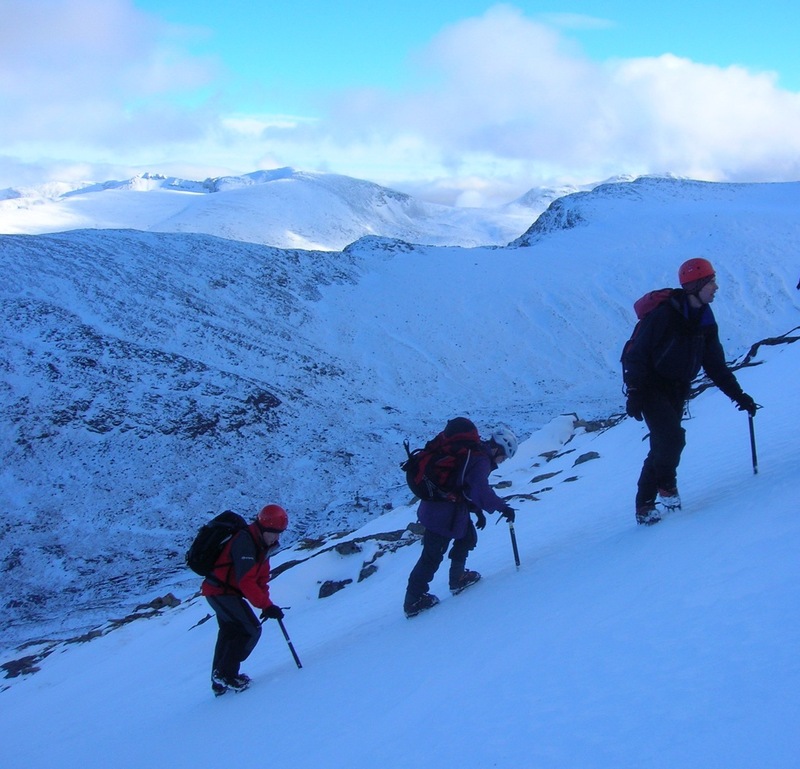 We have several folk booked on already so it should be a great opportunity to combine a skills & scrambling day with a high mountain day and develop more experience and confidence in preparation for an alpine trip this coming summer season.